Eclectus Parrot s have an unusually long digestive track that gives them the ability to efficiently extract nutrients from their food. As a result, they must have a very balanced and specific diet to help them stay well. In general organic foods are tastier, and healthier because they avoid the use of pesticides and chemicals. Here are 6 components necessary to keep your Eclectus properly fed and healthy. Fiber - Because their digestive tracks are unusually long, fiber is necessary to keep the track clear and food properly moving through it. This can be fed to them in the form of legumes such as slightly softened garbanzo, fava, lentils, and soybeans as well as whole grains. Fruits - They also enjoys and benefit greatly from fresh organic fruits such as apples, bananas, mangos, grapes, pomegranate seeds, watermelon, papaya, and oranges. Rotate new fruits as they come in season, and use thawed frozen fruits when fresh are not available. Dark Leafy Green Vegetables - The darker the leaf, the more nutrients it contains. So kale, mustard and dandelion greens, Swiss chard, spinach, beet and carrot tops are excellent sources of nutrients and should be chopped into small pieces to make them easier to eat. Other vegetables should include corn on the cob, broccoli, green beans and peas, and okra. Prone to have a Vitamin A deficiency, foods high in Beta Carotene should also be fed regularly as they are excellent natural sources of Vitamin A. Cooked carrots, yams, and sweet potatoes should be staples in their diet. Seeds and Nuts - Sprouted seeds are best because they are living plants, low in fat, and provide different nutrients daily as they continue to grow. Sprouts are one of the healthiest foods you can feed your bird. There are kits available that allow you to do it yourself, or you can buy seeds that are already sprouted. Be sure to provide them daily. As for nuts, young birds still need some fat to develop properly, but nuts should be fed sparingly to mature birds as they contain large amounts of fat that can cause health problems stemming from obesity. However, an occasional nut (one) for a mature bird can serve as a tasty treat. Pellets - Theoretically pellets are a great concept. Having all the nutrients packed into each tiny piece would seem to be a great way to ensure a healthy diet. However, some pellet mixes contain excessive sugar which can lead to kidney problems; and artificial coloring, preservatives, and flavoring that many pellet mixes contain can cause toxicity. Even the organic pellets which do not contain preservatives can make it easier for bacteria and fungus to grow-- which can pose serious health issues to your bird if ingested. So fresh foods always trump pellets. And if you decide to use them, they should be of a very high quality and comprise a minute portion of the total diet. 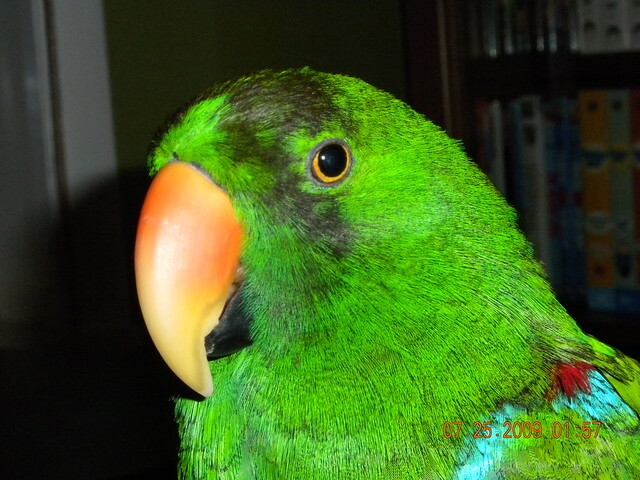 Avoid colored pellets at all costs as they prevent the Eclectus from producing properly colored feathers and beaks. Table Food - Scrambled eggs that are thoroughly cooked, cooked rice and beans, and a cracker are all fine on occasion. Birds are lactose intolerant so dairy products should be avoided unless they are lactose-free. Foods with high salt content should also be avoided. Chocolate, avocado, alcohol, rhubarb and foods with caffeine are toxic and can lead to the swift demise of your Eclectus or any bird. The Eclectus Parrot is an enthusiastic eater and will thank you for providing a healthy diet with many years of love and devotion.